I recently searched out this novel, mainly because it's written by someone I went to university with -- well, perhaps not "with", but at the same time as. While Carellin Brooks was not aware of me & my circle, we were certainly aware of her in her capacity as a Rhodes Scholar, which was very impressive to us. And then just as I finished this novel, I saw that the ReLit award nominee list was finally posted, and this is one of the nominees. It also won the 2016 Edmund White Award for Debut Fiction earlier last year. 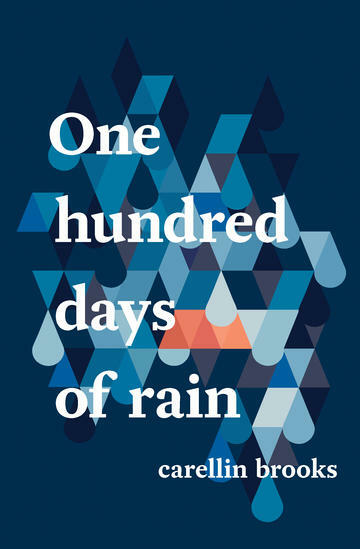 Told in 99 short chapters, this spare poetic novel relates the story of a breakup. It begins with a domestic dispute, one noticeable enough for the neighbours to call the police. And it turns into an uncomfortable she said/she said situation, as our unnamed narrator is arrested. It's also unexpected, playing against type, as she's revealed as the more delicate of the two women. The story is told from her perspective, working through her actions and emotions as this separation and eventual divorce are processed, through many long days of rain. It reads almost like a first person narrative, with emotional distance established by the use of she, her etc. rather than "I": the writer tells the story, not the narrator. The brief sections, which all dissect the narrator's life as she struggles through this rather nasty breakup, carry a repetitive rhythm that made me think of music; layering one instant over another over another until a full symphony is produced. Our narrator has a young son who is caught in the midst of the arguments between she and her estranged spouse, M. The young boy's father is also in the picture, adding another stressor to her new situation. But she makes it through; each chapter is another step in her journey. The writing is elegant and resists sentimentality. It's precise; Brooks doesn't use a deluge of words to describe the watery themes. I enjoyed the brief chapters -- like glimpses into parts of this character's life, now and then the past, and now again, each one illuminating just a little more about the failed relationship. As you read, the picture expands, and hindsight allows for a pattern and for a little bit of justification on the narrator's part. But, since you only see things from her vantage point, there is still room left to wonder what things looked like from the other side. It's raw and honest, full of sadness, regret, and yet still a bit of hope for the future, all while avoiding easy emotional storytelling. I think it might be the sympathy shown for the characters that wins over the reader. Each of the people who surround the narrator have their pluses and minuses, each has a part to play in this major change she's going through. And each hurts in their own way, also. And yet there are so many little things that offer momentary escape, like a spontaneous trip on the ferry, a sunny day, even a brief connection to surprised strangers who all experience a moment of hail on the street together. The narrator is a sympathetic lead, and her story is told with nuance and precision. The poetic evocation of both the emotional and actual landscape of her life adds something really special to this story. The story is beautifully framed by the 99 chapter structure, the writing is satisfyingly complex, and the emotion is authentic and haunting. I guess I'm still a little envious of the ability of the Rhodes Scholar I admired 25 years ago! I have this book on my shelf somewhere - you've convinced me to dig it out! Wow, that's great that you have a copy! Hope you will get a chance to read it this year; would like to hear your thoughts as well.